Words of the prayer, said by Nabonidus, king of Babylonia, the great king, when afflicted with an ulcer on command of the most high God in Temâ: "I, Nabonidus, was afflicted with an evil ulcer for seven years, , 'When I was afflicted for seven years by the most high God with an evil ulcer during my stay at Temâ, I prayed to the gods of silver and gold, bronze and iron, wood, stone and lime, because I thought and considered them gods...' [ until I prayed to the most high God. And an wise man pardoned my sins. He was a Jew from among the children of the exile of Judah, and said: 'Recount this in writing to glorify and exalt the name of the most high God.' Then I wrote this-[[fragament breaks up]]. 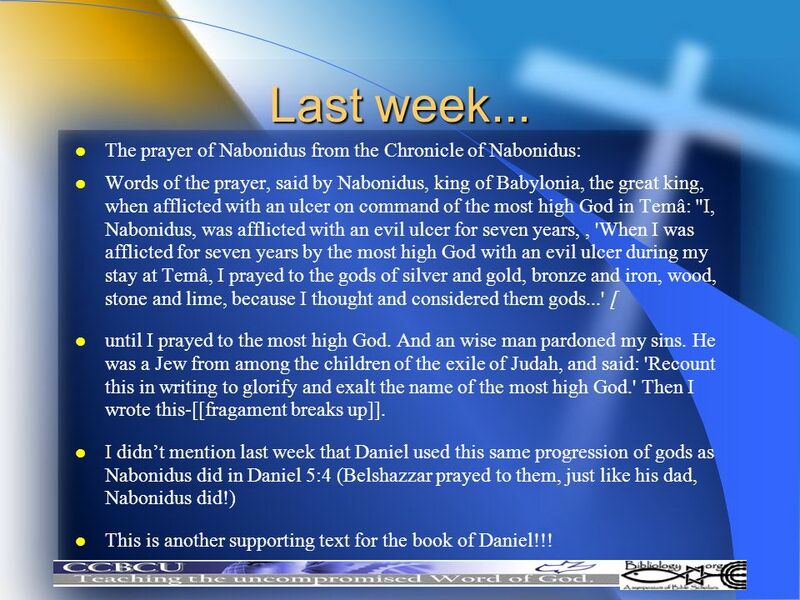 I didn’t mention last week that Daniel used this same progression of gods as Nabonidus did in Daniel 5:4 (Belshazzar prayed to them, just like his dad, Nabonidus did!) This is another supporting text for the book of Daniel!!! 3 Where are we in History? The date is 539bc. 4 Chapter 5 Now advanced in years, Daniel is a senior statesman in Babylon. He has outlasted a number of kings and in his time Belshazzar, the last of the Chaldean kings of Babylon, will be killed and Babylon will pass from Chaldean rule to rule by Darius the Mede. In chapters 1-4, we have an account of the life of Nebuchadnezzar, the first Babylonian king to rule over the captive Jews. The account looks at several events in the life of this great king, which eventually bring him to his knees in worship and praise of the God of Israel. Daniel then passes over several kings, giving us this brief account of the last day in the reign of Belshazzar, the last of the Chaldean kings. Nebuchadnezzar died in bc Special Note From our Rabbi Friends: It is held by them that the Rabbi's and Sages orally passed down the books until the 'men of the great assembly' by God's inspiration wrote out the oral traditions. Bava Basra 15a They hold that Esther, Ezeckiel, Daniel to name a few were written by the Great Assembly of unnamed, godly, jewish men. They hold that prophecy could not be written outside of Eretz Yisrael , so all prophecy given during the Diaspora or the excile was maintained orally until they could get back to Jerusalem - back to Israel! 6 The Kings ... The most accurate account of the Kings between Nebuchadnezzar and Belshazzar is taken from Berosus and agreed upon by Josephus. It goes Nebuchadnezzar who reign 43 years( ), Evil Marduck who reigned 2 years(to 560), Neriglisar reigned four years(to 556), his son (Laborosoarchod) reigned 9 months(556), and then Nabonidus reigned seventeen years( ), the last 10 of those his son, co-regent Belshazzar( ) co-reigned with him while he was retirement. Of all the so-called problems with Daniel, this one was the most difficult to deal with. 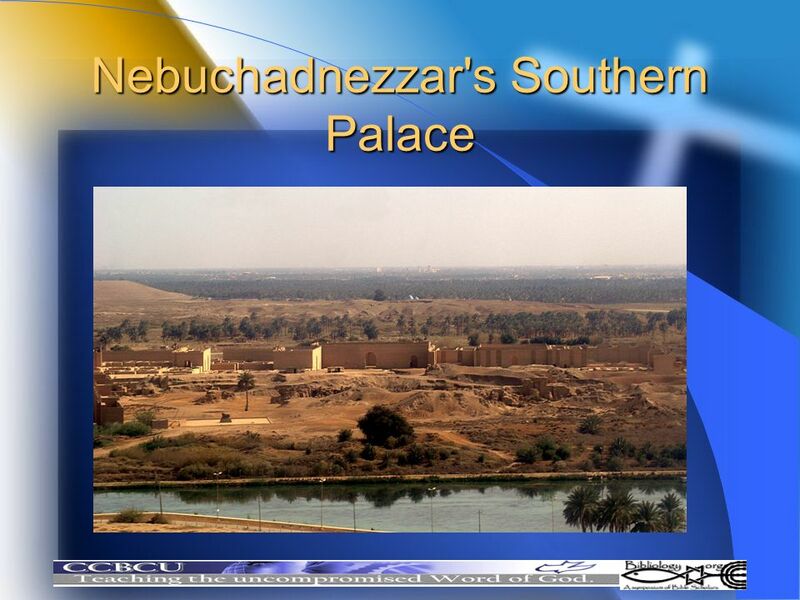 Nebuchadnezzar, succeeded by his son Evil-Merodach (Akkad. AmelMarduk, "man of Marduk"), who released the captive Jewish king, Jehoiachin, from prison and gave him an honorable place at the court (2 Kings 25:27-30) But two years later Evil-Merodach was assassinated by his brother-in-law, General Neriglissar(Jerm.39:3,13) (Akkad Nergal- shar- usur"Nergal, protect the king! 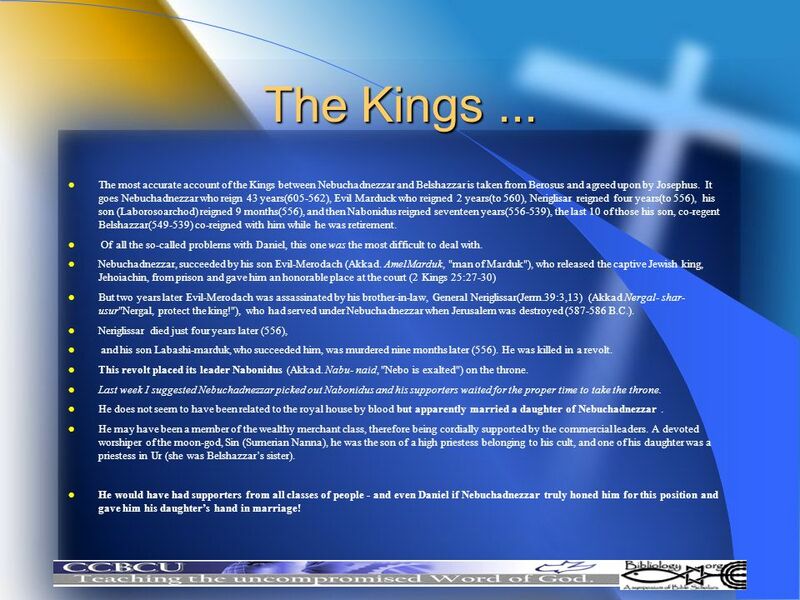 "), who had served under Nebuchadnezzar when Jerusalem was destroyed ( B.C.). Neriglissar died just four years later (556), and his son Labashi-marduk, who succeeded him, was murdered nine months later (556). He was killed in a revolt. This revolt placed its leader Nabonidus (Akkad. Nabu- naid, "Nebo is exalted") on the throne. Last week I suggested Nebuchadnezzar picked out Nabonidus and his supporters waited for the proper time to take the throne. He does not seem to have been related to the royal house by blood but apparently married a daughter of Nebuchadnezzar . He may have been a member of the wealthy merchant class, therefore being cordially supported by the commercial leaders. A devoted worshiper of the moon-god, Sin (Sumerian Nanna), he was the son of a high priestess belonging to his cult, and one of his daughter was a priestess in Ur (she was Belshazzar’s sister). He would have had supporters from all classes of people - and even Daniel if Nebuchadnezzar truly honed him for this position and gave him his daughter’s hand in marriage! 7 The Attack on Babylon The Berosus text states this:”… Nabonidus…magnificently built with baked brick …the walls. In his 17th year Cyrus advanced from Persia with a large army, and , after subjucating the rest of the kingdom came to Babylon.. Appraised of his coming Nabonidus led his army to meet him, fought and was defeated, where upon he fled with a few followers to in the town of Borsippa.” Nabonidus retreated south toward his salient at Tema (or Teima). 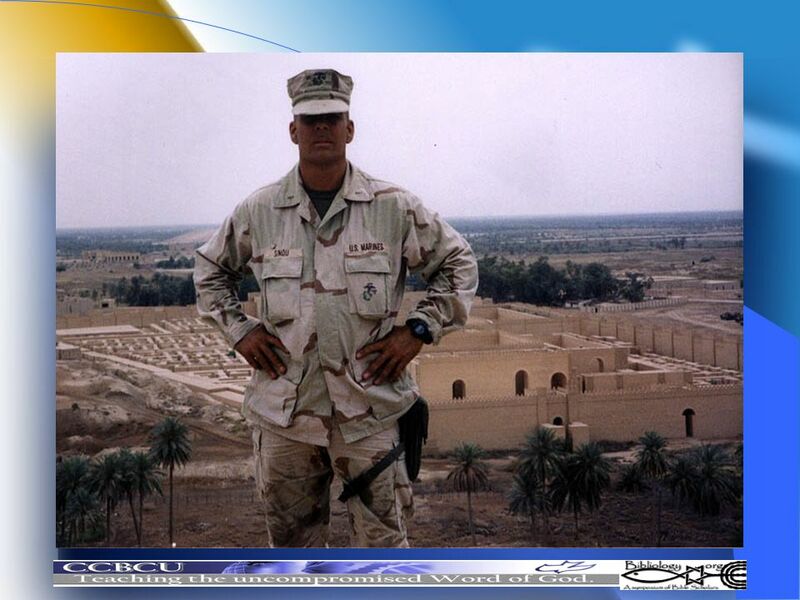 Babylon was still a fortress that was awesome! 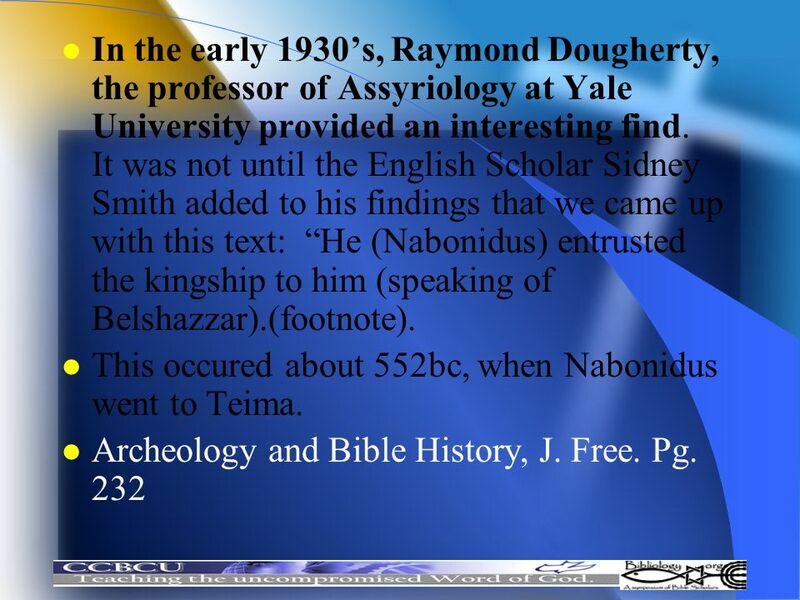 Remember, the last 10 years of the reign of Nabonidus, he was in retirement and Belshazar was acting king. 7 of those years Nabonidus had a skin disease, and a Jew wrote him about God most high, he repented and was healed. 8 In the excavation of Qumran Cave 4 in 1952, an Aramaic fragment of a prayer of thanksgiving attributed to Nabonidus was discovered. The translation by Milik into French is approximately as follows: "The words of the prayer which Nabunai(d), king of Assyria and Babylon, the great king, prayed when he was smitten with an unpleasant skin-disease by the ordinance of God Most High in the city of Teima: `I was smitten with an unpleasant skin-disease for seven years ... But when I confessed my sins and my faults, he granted me a (favorable) verdict. And there was a Jew from ..., and he wrote and told (me) to give honor ... to the name of God Most High'" (this conjectural translation, dependent on several restorations of missing letters, was published by J.T. Milik in Revue Biblique, 63 (1956): 408; cf. Saggs, Babylon, p. 154, for the English version above). The Berosus text states this:”… Nabonidus…magnificently built with baked brick …the walls. In his 17th year Cyrus advanced from Persia with a large army, and , after subjucating the rest of the kingdom came to Babylon.. Appraised of his coming Nabonidus led his army to meet him, fought and was defeated, where upon he fled with a few followers to in the town of Borsippa.” Nabonidus retreated south toward his salient at Tema (or Teima), leaving the Persians free access to the capital. 13 It could be that all inside the Babylonian fortress assumed Nabonidus was killed and Belshazzar made himself king - and this would also explain why he had a great feast - to honor himself as the new King. Thus, Daniel would have assumed he was the last King of Babylon, since Nabonidus was either dead or ran away as a coward - leaving the throne to the acting regent, Belshazzar. The 16th day(of tushri Oct. or Sept.), Gobryas (Ugbaru) the governor of Gutium and the army of Cyrus entered Babylon without battle." 20 While Belshazzar partied, the Medes and the Persians came in and took Babylon, just as prophesied! Is. 13:17-22, 21:1-10, Jer. 51: Some of these prophecies have a double fulfillment, and will be completely fulfilled in the future (Rev ). This was some kind of party! It was not uncommen for Monarchs in this time to have huge feasts. The ancient historian Ktesias states monarchs in these days (7-6th century bc) were known to have plus guests. 23 It is not the size of this celebration that is shocking, but the timing - remeber, they were surrounded by the Persian army, who just killed many of their soldiers and drove the others away. They did feel secure however - as mention, Herodius, the ancient historian writes that the wall was 87’ wide and 350’ high, with towers reaching another 100 feet at regular intervals, and strong enough for 4 chariots to ride side by side in parade. 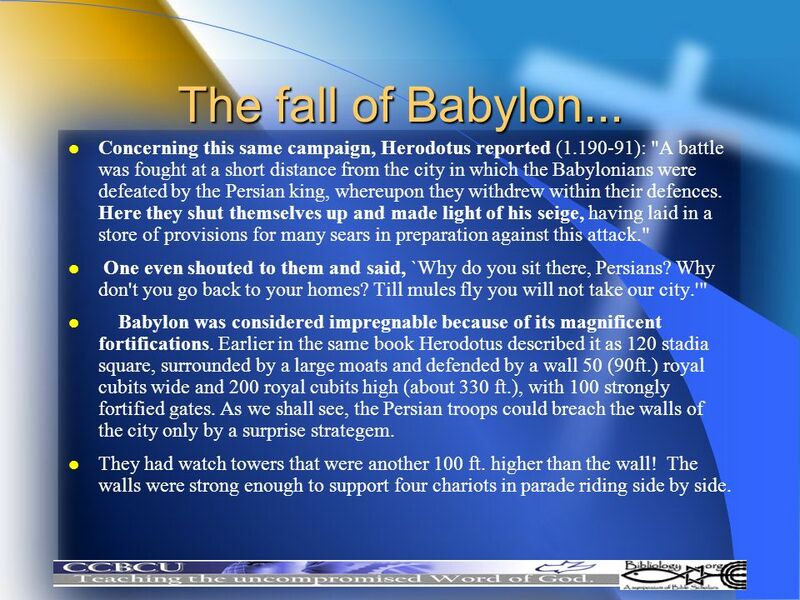 24 The fall of Babylon... 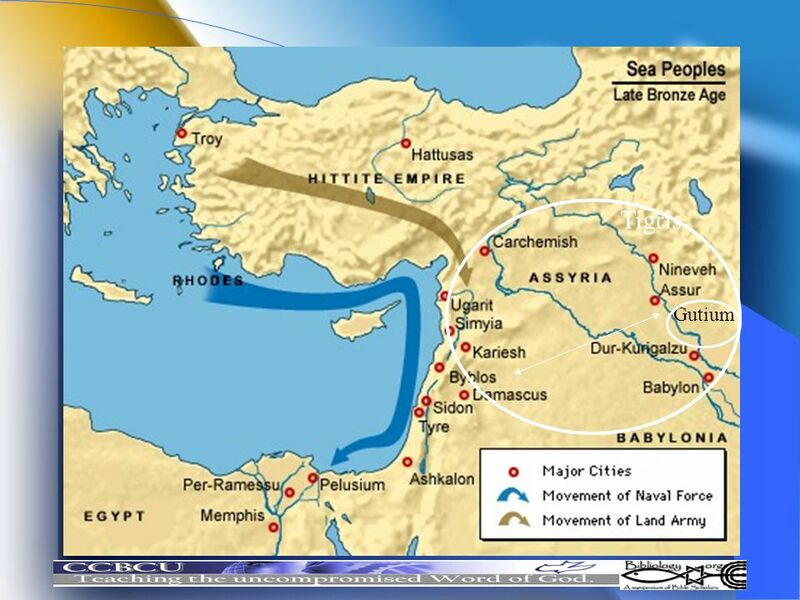 Concerning this same campaign, Herodotus reported ( ): "A battle was fought at a short distance from the city in which the Babylonians were defeated by the Persian king, whereupon they withdrew within their defences. Here they shut themselves up and made light of his seige, having laid in a store of provisions for many sears in preparation against this attack." One even shouted to them and said, `Why do you sit there, Persians? Why don't you go back to your homes? Till mules fly you will not take our city.'" 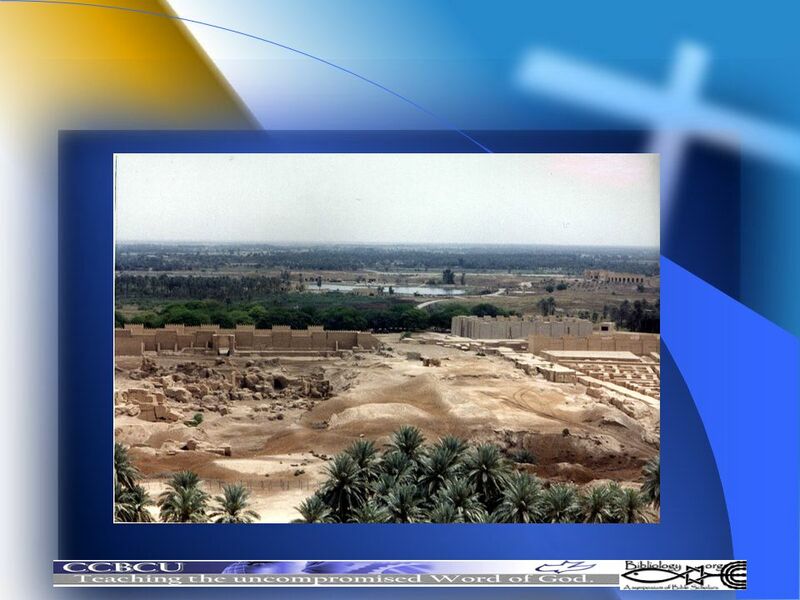 Babylon was considered impregnable because of its magnificent fortifications. Earlier in the same book Herodotus described it as 120 stadia square, surrounded by a large moats and defended by a wall 50 (90ft.) royal cubits wide and 200 royal cubits high (about 330 ft.), with 100 strongly fortified gates. 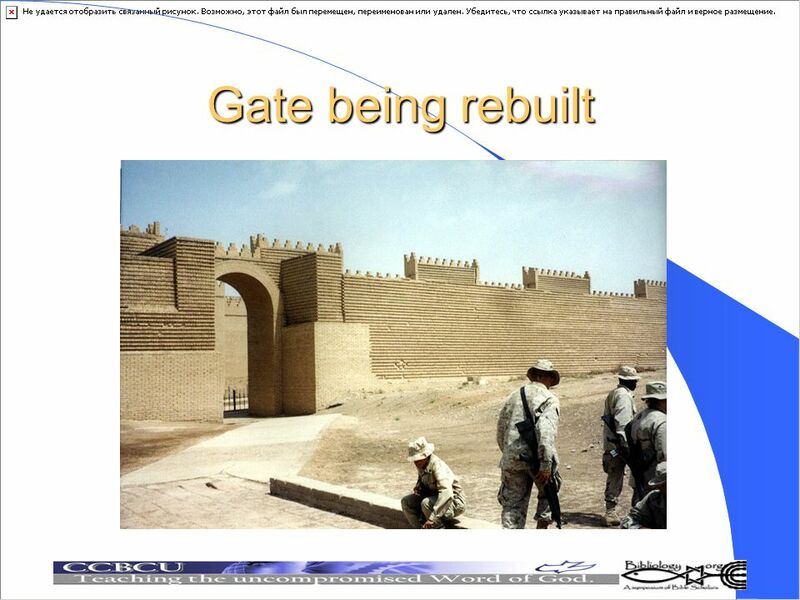 As we shall see, the Persian troops could breach the walls of the city only by a surprise strategem. They had watch towers that were another 100 ft. higher than the wall! The walls were strong enough to support four chariots in parade riding side by side. 5:30 Yossipon, Yalkut, Shir HaShirim & the Rabbah 3:4 Their tradition holds that Belshazzar's court all new Daniels prophecy would come to pass, so they killed Belshazzar and presented his head to Darius as a peace gesture. Josephus, in Antiquities X, 11.4 states that the Medes diverted the Euphraties River and took Belshazzar by suprise and killed him. Secular historians Herodotus and Xenophon both recount that Babylon was having a wild drunken celebration, and the Eurphraties river was diverted, and Cyrus' army came in and found Belshazzar surrounded by his mighty men, with his sword in hand, and they macasacered them all, thus seizing controle of the Babylonian empire. Isaiah prophesied this downfall about two centuries earlier (Is. 21:1-10) As seen in Daniel in the Critics Den - The most accurate interpretation of the Babylonian Chroniclses, lines read: "On the night of the 11th of Marchesvan, Gobryas descended against Babylon and the son of the King died"
26 Darius the Mede... Borosus writes: “ The 16th day(of tushri Oct. or Sept.), Gobryas (Ugbaru) the governor of Gutium and the army of Cyrus entered Babylon without battle." Daniel tells us this is Darius the Mede. The problem is reconciling the two. 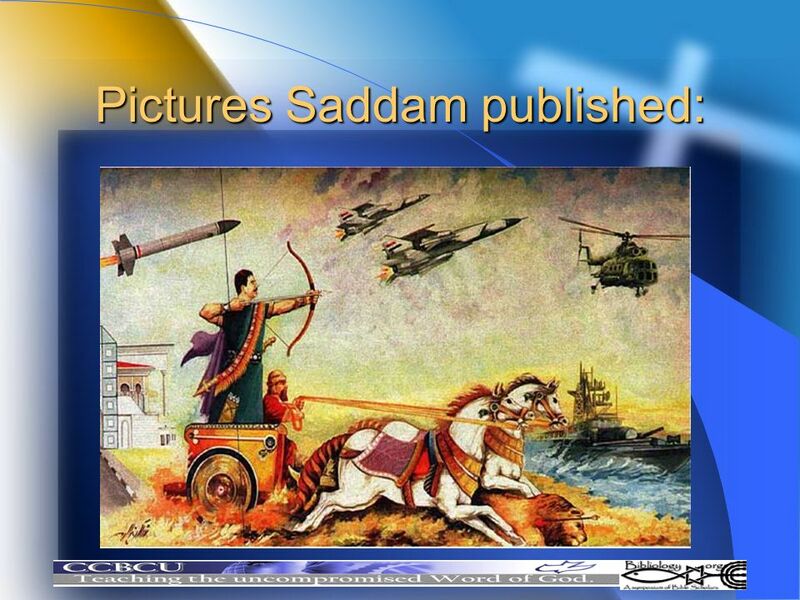 “The 15th day (of Tashritu or Tishri), Sippar(Babylon) was seized without a battle. Nabonidus fled. The 16th day Ugbaru, the governor of Gutium, and the army of Cyrus entered Babylon without a battle ... In the month of Arahshamnu, the 3rd day, Cyrus entered Babylon, green twigs were spread in front of him--the state of peace was imposed upon the city. Cyrus sent greetings to all Babylon. Gubaru, his governor, installed sub-governors in Babylon ... “ Assyriologists assure us these two spellings are the same name. Another way to spell his name is Gobrius. 27 Why did Daniel call him Darius? 30 Reference to Gutium... For seven years Naram-Sin waited for Enlil to forgive him. But the angry god continued to turn his back on him. Then, however, it eventually came to an end with the kings patience. Furiously he rushed against Enlil's temple, Ekur, in the city Nippur. He opposed Enlil, crushed those who defended the god. He destroyed Ekur and soiled the holy chambers, and exposed the holy objects to the mob. But that he should never have done. Because if he had experienced hardship before, then it became much worse now. A curse was thrown an Agade: "Oh, valiant Enlil, the city that has destroyed your city may it become like your city, ... ... Of that city, may skulls fill its wells, ... ... May famine kill the people of that city." The curse was fulfilled: "He (Enlilck) lifted his eyes to the ... mountain, .... The unsubmissive people, the land whose people is without number, Gutium, the land that brooks no control, whose understanding is human, but whose form and stuttering words are that of a dog, Enlil brought down from the mountain. In vast numbers, like locusts, they covered the earth, ... Nothing escaped their "arm", ..." In the continuation of the text it is told, that Agade became totally destroyed, never again to be inhabited. It is right that the Guteans ran Agade over and destroyed the city; though it did not happen in Naram-Sin's time, but only about seventy years later. On the other hand there is no doubt, that the Guteans were making problems already in Naram-Sin's time. The original home for the Guteans was the Zagros-mountains north of Elam. J.J. Finkelstein argues for the view, that they must have left the Zagros-mountains and have wandered northwest to the Habur-area in Subartu; and that it was from there they started there immigration, first in northern Mesopotamia, and later in Akkad . 31 The account of Cyrus When I entered as a friend and when I established the seat of the government in the palace of the ruler under jubilation and rejoicing, Marduk, the great lord, induced the magnanimous inhabitants of Babylon to love me, and I was daily endeavoring to worship him. My numerous troops walked around in Babylon in peace, I did not allow anybody to terrorize any place of the country of Sumer and Akkad. I strove for peace in Babylon and in all his other sacred cities. As to the inhabitants of Babylon who against the will of the gods were [enslaved? ], I abolished the corvée which was against their social standing. All the kings of the entire world from the Upper to the Lower Sea [i.e., from the Mediterranean Sea to the Persian Gulf], those who are seated in throne rooms, those who live in other types of buildings as well as all the kings of the West land living in tents, brought their heavy tributes and kissed my feet in Babylon. As to the region from [lacuna] as far as and Susa, Agade, Eshnunna, the towns of Zamban, Me-Turnu, Der as well as the region of the Gutians, I returned to these sanctuaries on the other side of the , the sanctuaries of which had been ruins for a long time, the images which used to live therein and established for them permanent sanctuaries. I also gathered all their former inhabitants and returned to them their habitations. Furthermore, I resettled upon the command of Marduk, the great lord, all the gods of Sumer and Akkad whom had brought into to the anger of the lord of the gods, unharmed, in their former chapels, the places which make them happy. In this text -a damaged clay cylinder now in the British Museum- describes how he conquers the old city. is considered a tyrant with strange religious ideas, which causes the god Marduk to intervene. 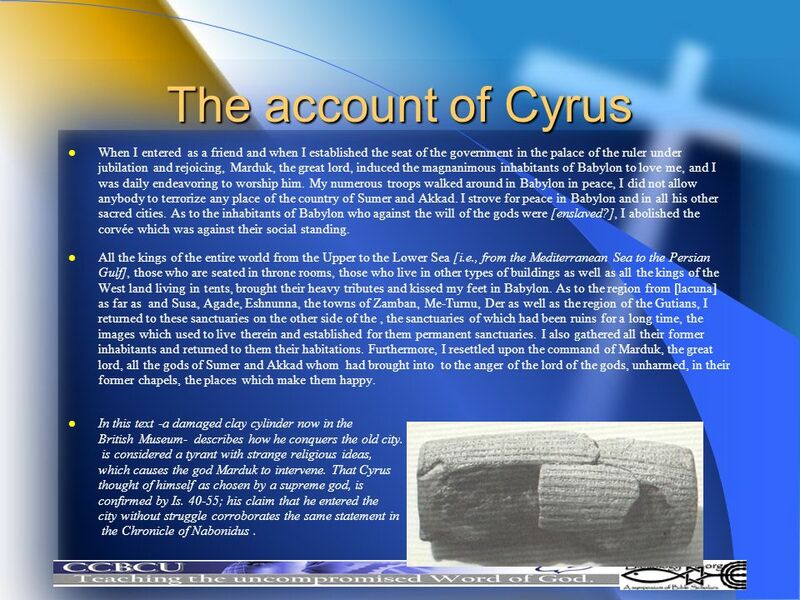 That Cyrus thought of himself as chosen by a supreme god, is confirmed by Is ; his claim that he entered the city without struggle corroborates the same statement in the Chronicle of Nabonidus . 32 Now, Cyrus may have assumed the throne as early as 6 months after Darius took Babylon. Even after Cyrus took the throne - Darius (Gobrius) remained as governor of Babylon. How do we know? It is evident from the cuneiform records referred to above that Gubaru continued to serve as governor of Babylon even after Cyrus's decease. The tablets dating from 535 to 525 contained warnings that committing specified offenses would entail "the guilt of a sin against Gubaru, the Governor of Babylon and of the District beyond the river [i.e., the regions North of the Tigris]" (Whitcomb, p. 23). Now it all is making sense, and supporting the Biblical record as well! 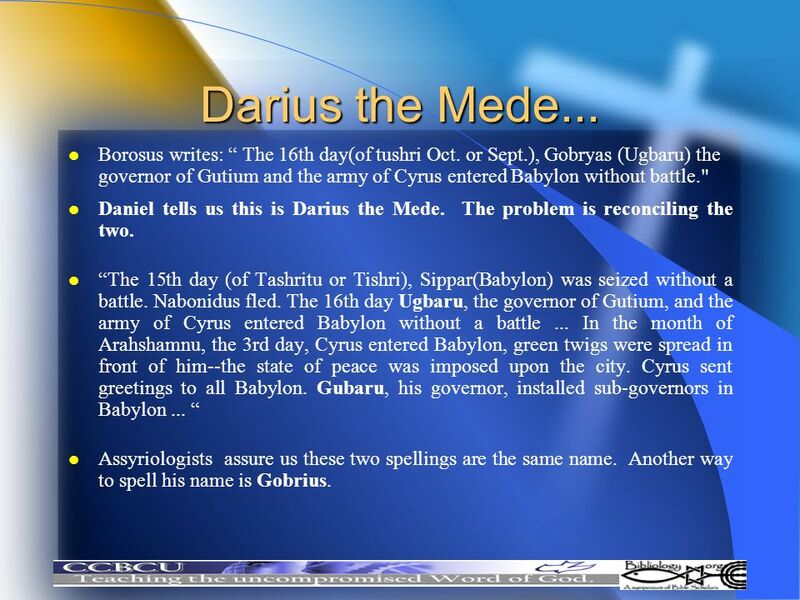 33 Additional support to Gobryas being Darius the Mede is the fact that Daniel states Darius appointed Satraps and the Babyloniean Chronicle also stated Gobryas apppointed govenors in Babylon. Rabi Yossipon in (comm. v. 1) in the Rabinic Talmud states conclusively that Darius was Cyrus' father-in-law and confirmed by 'the men of the great assembly' (a group that some Rabbi's insist wrote some of the scriptures - including Esther,Daniel, & Ezekiel.) 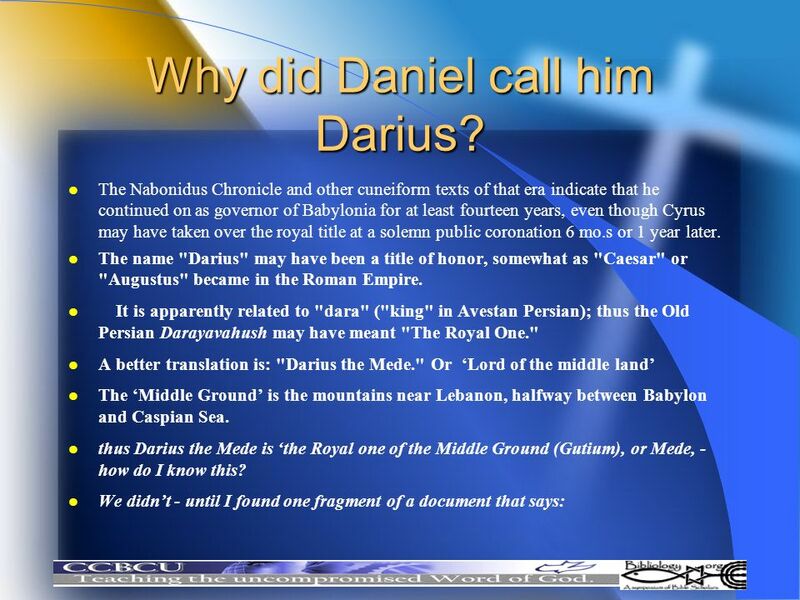 Also, Daniel 9:1 states Darius is the son of…Ahasuerus. Daniel 9:1 Who is Ahasuerus? One fragment states the Gobryas was the son of Ahasuerus. - Josephus agrees and states that Darius was the son of Ahasuerus. Xenophon supports this theory by confirming that Ahasuerus was indeed a Median King, The book of Esther also supports this king. Xerxes is the a variant of Ahasuerus. This is the father of Darius. Also , we read that Gobryas was considered a Manda - or Barbarian - who were taken into the medians empire, for Astyages ( Josephus agrees and calls him Astyages - Ahasuerus), a Median King in Ecbatana - was also called '...a soldier of the Manda' The Talmud in Megillah 11b uses 9:1 to validate Darius with Esther 1. The sages, whom Rabbi's call their wise men and attribute to Rabbinic tradition, also agree with this scenerio. Astyages, a confirmed Median King, is the same as Ahasuerus mentioned in Daniel 9 and Esther 1 (Ahasuerus is the Hewbrew form of Xerxes), and that Darius is his son as mentioned in Daniel chapter 9. 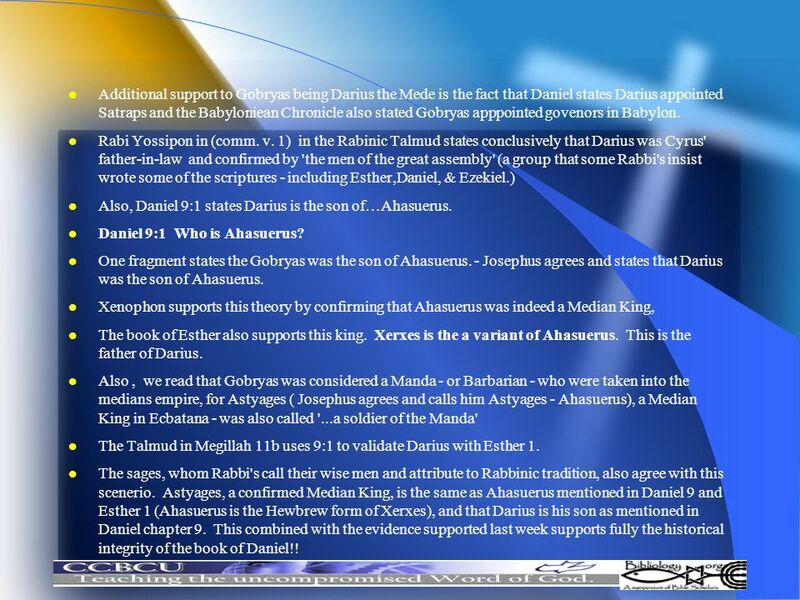 This combined with the evidence supported last week supports fully the historical integrity of the book of Daniel!! 34 I hope this helped! You may find different timelines and theories, ranging from Cyrus was also known as Darius (this one is unsubstantiated) to the reference to Darius by Daniel was simply a mistake, and that Daniel was referring to King Darius who wouldn’t come on the scene until 522BC. All of these ideas compromise the Biblical record and make the entire book of Daniel unreliable. The theory I presented is the most supported and historically accurate one I’ve found. Some had speculated what we covered, but proof was hard to find. I hope this proves Daniel is reliable and authentic. 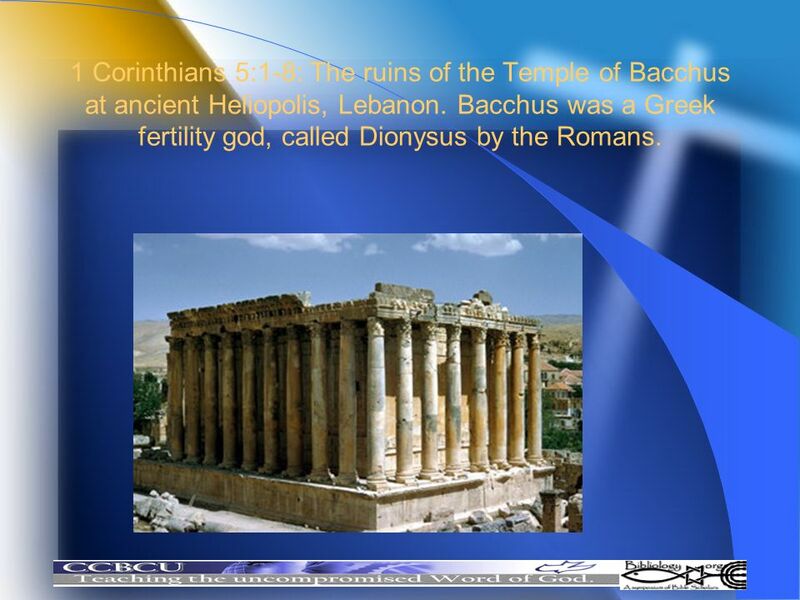 36 1 Corinthians 5:1-8: The ruins of the Temple of Bacchus at ancient Heliopolis, Lebanon. Bacchus was a Greek fertility god, called Dionysus by the Romans. 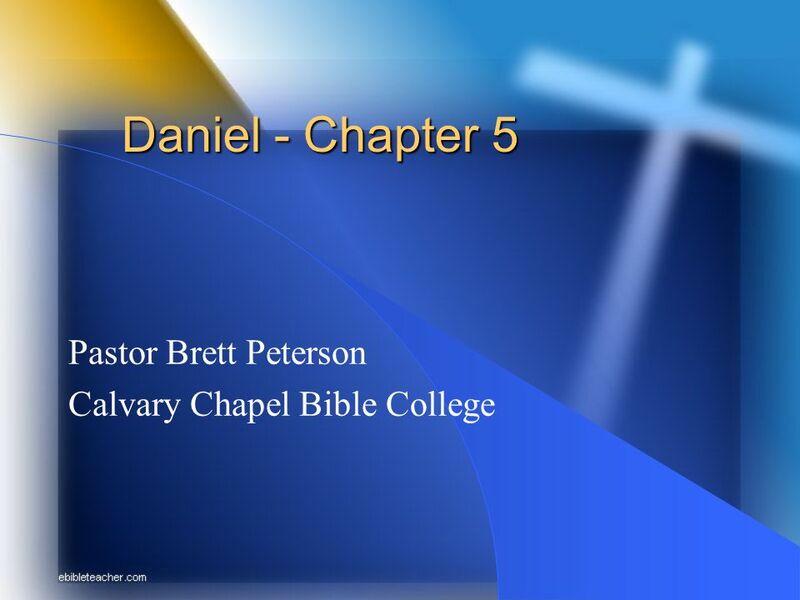 Download ppt "Pastor Brett Peterson Calvary Chapel Bible College"
The Exile in Babylon. What is the one thing you think God HATES the most? SIN! Colossians 1:15 15 He is the image of the invisible God, the firstborn of all creation. The Major Prophetic Books MjP4:The Book of Daniel The Statesman and Prophet Bible Study for Pr-Servants Dec 17, 2011. The Growth of Judaism Get Ready to Read Section Overview This section focuses on the growth of Judaism, including the challenges it overcame and the setbacks. Ancient Israel Prepared by Anita Billeter Palmdale School District with funding from Jordan Fundamentals Grant Keeping History Alive Grant. The Ancient Hebrews The Origins of Judaism The Hebrews were: a people who settled northeast of Egypt, in Canaan, about 1950 B.C.E. They were the founders. God’s Future Program for Israel Daniel 9:20-27 Leopold Cohn. Daniel. Prophecy is history Written in advance. Background ● New Assyrian Empire has taken control of all of Mesopotamia ● Under Sargon II Conquer and. UNWAVERING FAITH 2 Chronicles 32:1-23. UNWAVERING FAITH Threat Threat Trust Trust Triumph Triumph. Old Testament Survey: The Book of Ezra. 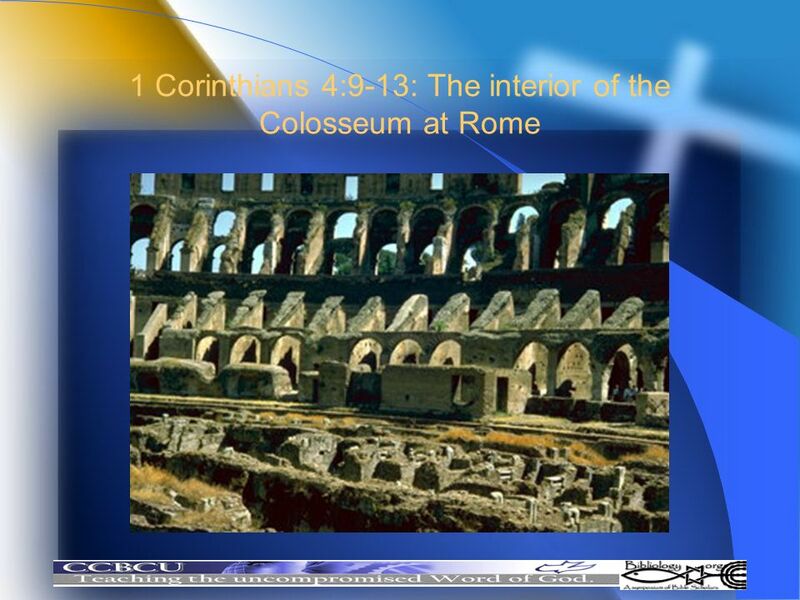 Keys to the Book Key words/phrases—Restoration and “house of the Lord.” ( temple ) God’s people in Babylonian. History of Persian EmpireHistory of Persian Empire. Ezra Priest and Scribe. Ezra 1 1 In the first year of Cyrus king of Persia, in order to fulfill the word of the L ORD spoken by Jeremiah, the L ORD moved.